83 out of 100. Incorporating 275+ ratings and reviews. Get Hands-On Control - Launch multiple clips at once, trigger scenes and navigate your Ableton Live session. Control Ableton Live - Integrate immediately and seamlessly with Ableton Live, without any setup whatsoever. Just plug in and start making music. Focus On Your Music - All 64 RGB pads light up to match the colour of your clips in Ableton Live and you can see at a glance what’s loaded, playing and recording. Play Drum Racks - Use the grid to play drums and samples with pads pre-mapped to Ableton Live's drum rack. Mix From Your Grid - Start and stop loops, arm tracks, and control volumes, pans and sends. The eight vertical rows of pads double up as stepped faders. Create Eye-Catching Performances - Bright, colourful pads make the unit stand out just from USB power; on stage or when creating exciting Launchpad light show videos that are all over YouTube. Throw It in Your Bag - Sleek, tough and lightweight, Launchpad is fully USB bus powered so you’ll never need to carry a power supply. Build Your Own Creations - Use your Launchpad however you like with Max for Live. Turn it into a step sequencer, trigger videos from drum pads or use it to create just about anything you can imagine. 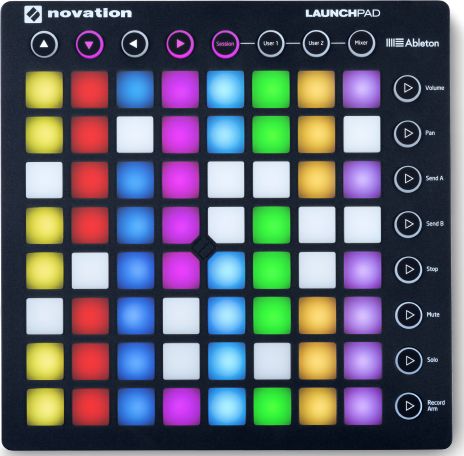 Build your perfect instrument - Combine more Launchpads or other Launch products to build yourself a fully hands-on Ableton Live studio, with Launch Control, Launch Control XL or Launchkey. Make Music Straight Away - Comes with Ableton Live Lite, 1GB of royalty-free Loopmasters samples, Novation V Station and Bass Station VST and AU plug-ins.